The FSO's emblem graces LiveJournal's logo. Images mixed by Kevin Rothrock. The Russian Federal Protective Service (FSO) is asking software developers to design a system that automatically monitors the country’s news and social media, producing reports that study netizens’ political attitudes. The state is prepared to pay nearly one million dollars over two years to the company that wins the state tender, applications for which were due January 9, 2014. Though the FSO’s RuNet-monitoring contract has been online [ru] at the government’s official Procurement Portal, www.zakupki.gov.ru, since December 18, 2013, news of the project broke only today, January 10, 2014, when the newspaper Izvestia published an article [ru] about it. When it must, Izvestia works as a true propaganda machine. See how, for the blogosphere monitoring story, they went for “criticism” to Kononenko. Anton Nossik, another titan of the Russian Internet and an extremely popular blogger, agrees that Izvestia’s article played the role of propaganda, but he sees it as distraction rather than promotion. According to Nossik [ru], the FSO’s grand monitoring system is nothing more than a cheap scheme to siphon money from the state budget, charging millions of rubles for software that simply googles publicly available content. More importantly, Nossik discovered that the FSO hired a company to design an identical project [ru] in September last year, when the price tag was far smaller, at just over US$200,000. 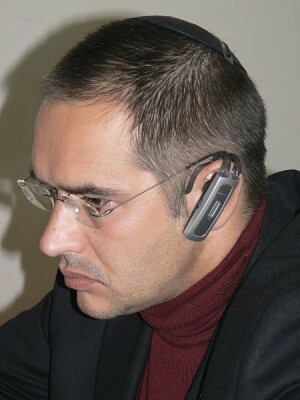 Anton Nossik, 21 February 2007, public domain. One week after the FSO launched a second auction for a new round of Internet monitoring, an entrepreneur named Lana Istomina [ru] lodged a complaint with the Federal Antimonopoly Service, objecting to terms in the FSO’s 75-page contract [ru] that specify the need to use one of four preselected media-monitoring software tools (Glass, Medialogia, Prism, or Medialogia-BAZZ). According to Istomina, the FSO’s refusal to accept bids built on equivalent tools represents a violation of Russian antitrust law. Весь смысл тендера — второй раз заплатить государственными деньгами за то же самое, что уже куплено в прошлом году. ИП Истомина Л.А. так написать не может, потому что она не может это доказать. Но схема эта не блещет новизной и революционностью, мы такое видим из года в год. Объявление тендера на создание уже существующего продукта — простой и удобный способ по-быстрому освоить бюджетное бабло под благовидным предлогом. The whole point of the tender was to pay out state money for a second time for the same thing they’d already bought last year. Now, the entrepreneur Lara Istomina can’t write that because she can’t prove it. But this scheme hardly shines as novel or revolutionary. We see the same thing from year to year. Announce a tender for the creation of an already-existing product—it’s an easy and convenient way to spend some quick government cash on a reasonable pretext. Because it’s so common on the Russian Internet, Nossik’s skepticism about the FSO’s monitoring project would be easy to dismiss. That, however, could be a mistake. The fact that the FSO already operates an identical monitoring project, the steep rise in the cost of this already-completed and automated work, and the presence of Ms. Istomina’s antitrust complaint—it all lends credence to Nossik’s suspicions. In other words, Russian bloggers now screaming bloody murder about state censors may be ignoring the real bad guys, petty crooks that they are.